In many parts of the world there are significant financial incentives for homeowners to install roof-top solar panels. This can include capital grants for the equipment, tax write-offs and/or Feed-In-Tariffs that guarantee that electricity produced by the solar panel will be purchased by the local utility at above-market prices. In Hawaii the annual cost of these incentives is at least $200 million. In Germany it is now in the $billions. As I pointed out in an earlier blog posting there is inherent unfairness in these subsidies which are only available to relatively wealthy single-family home owners. People living in multi-family dwellings, renters, and those on low or fixed incomes that cannot afford the capital costs of the installation cannot share in these programs. They can, however, contribute through taxes and electricity bill payments to the cost of the subsidies. They can also disproportionately help pay for the added complexities of a grid that can incorporate distributed power generation. The incentive programs in many areas are also vulnerable to abuse. One couple in Ohio have installed over $180,000 worth of solar panels in order to provide year-round heating for their large indoor swimming pool and indoor tennis court. I’m sure they are most grateful to the taxpayers of Ohio and in fact the entire U.S. for the more than $55,000 they will receive in various tax breaks. 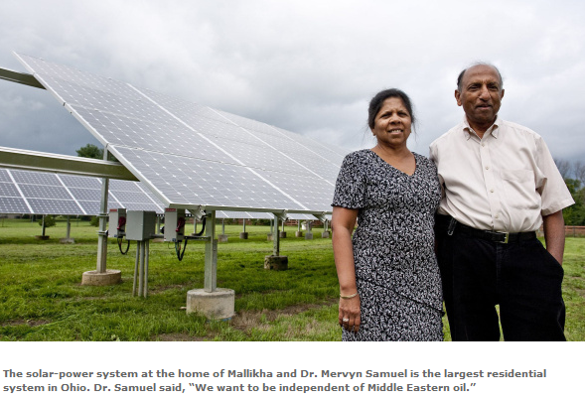 And by the way, their solar panels do not help anyone become independent of Middle Eastern Oil. Electricity in Ohio is generated primarily by coal-fired plants with a small amount from natural gas-fired and nuclear plants. Putting aside the fairness issue there is also a very strong argument against residential roof-top solar panels based upon basic economics. If you live in the suburbs your street probably has dozens of single family homes of different sizes and shapes with various configurations of roofs covered by a variety of materials. Imagine if you will a veritable army of roofers crawling over these houses, attaching frames and mounting solar panels. If you think about that for a moment you will have to come to the conclusion that it is not an overly efficient operation. Lots of up and down ladders time and safety setup time and not so much install solar panel time. Now imagine that same scenario when it is raining or snowing – more than a little scary for everyone involved. Compare that to utility-scale solar where uniform racks can be laid out and solar panels mounted from the ground in a matter of minutes. The two scenarios are illustrated by the photographs. Recognizing that the public and electrical utility customers are footing a large part of this installation bill which configuration would seem to provide the best return on investment? It would be hard to argue against the utility-scale solar panels. What about efficiency in terms of making the best use of the solar resource? In the case of residential roof-top solar there are likely to be plenty of other buildings, trees, and hills nearby so that the solar panels are often in the shade. Almost all of these solar panels will also be mounted rigidly, most commonly at the angle that is the roof pitch. This will not be the optimal angle for most sites and latitudes. Utility-scale solar panels can easily be equipped with single or dual-axis tracking which very significantly increases the power generated under all circumstances. They will also be located in large open areas where they will be in direct sunlight for most of the day. Having small, deep-cycle batteries as backup for the solar panels might be an expensive necessity at Possum Lodge but in suburban North America that type of installation doesn’t make a lot of sense – which is probably why almost nobody does it. Instead, through the magic of net metering, the surplus solar at mid-day is pushed out onto the grid whether it is needed or not. The home-owner effectively gets to use this mid-day electricity as a credit against the much more expensive evening and night electricity that would otherwise have to be purchased from the local utility at peak demand prices. For the local utility the end result is a significant reduction in revenues from the owners of the roof-top solar panels even though they are making the grid more expensive to build and maintain. Who picks up the slack? Everyone that does not have roof-top solar panels. The home owner that installs the roof-top solar panels will probably be pretty excited about them and will maintain them to some degree. But as houses change hands that commitment could fade; as leaves, moss, and dirt accumulate through the years who is going up on the roof-top to polish up those solar panels. Nobody is my guess. So the overall efficiency of the panels is bound to decline over time. The same with local battery storage if it has been installed. 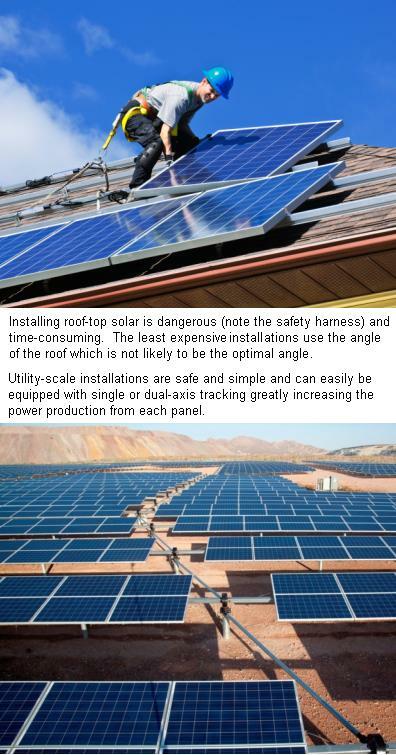 Finally, the presence of roof-top solar panels has been identified as a significant danger to fire fighters. All in all, looking at roof-top solar panels perfectly objectively they just don’t make sense. There are better ways to spend those dollars as we transition away from a hydro-carbon economy. Some other ideas are described in my Sustainable Energy Manifesto. Oct-2016 Update: A study by the Brattle Group provides a detailed analysis that concludes that utility scale solar is less than half as expensive to develop and produces far better environmental results than residential roof-top installations. Another study commissioned by a California utility found that relying upon roof-top solar to meet the carbon reduction goals of the state was the most expensive and least reliable approach. Reports are beginning to emerge regarding the difficulty of selling homes with leased solar systems. As financial incentives are wound down to rational levels I would predict that many home owners will likely not re-install their solar panels when roofs need to be replaced. The electricity generation situation in British Columbia, Canada is both simple and complex. The simplicity arises from an abundance of hydro-electric generating capacity. The complexity comes from a somewhat disjointed ownership of generating assets compounded by government policies that have been confusing to both generators and rate-payers. Starting in 2002 BC Government policy mandated that BC Hydro (the publicly owned near-monopoly) change the way it added new generation capacity. Updates to existing hydro facilities and development of new large-scale hydro facilities would remain with BC Hydro. However, integration of new renewable and small-scale hydro generation would have to be through long-term purchase contracts with Independent Power Producers (IPPs). The rationale provided for this decision was the desire to transfer the risk of investments in new generation to the private sector. Given the guaranteed electricity rates, long-term locked in contracts (20 to 40 years) and “take or pay” provisions I don’t see much risk being transferred to the IPPs. What I do see is guaranteed increases in power rates for electricity which might not be required or might be better provided through public sector investments. As you might expect there has been a veritable stampede of IPPs bringing forward all manner of generation proposals. Over-subscription is usually an indication that what’s on offer is a pretty safe investment. There are two fundamental issues at the heart of BC’s push for additional generation capacity (and the resultant growth in IPPs) . The first issue is the Provincial Government’s stated desire to make BC “self-sufficient” in terms of electricity generation. Just how to determine whether or not this condition has been met is a contentious issue. As in every jurisdiction peak demand in BC lasts for only a few hours on a few days or weeks of the year. At all other times and on all other days there is ample generation capacity already existing in the province. So how do we handle those peak demand events which might be due to low water levels in hydro reservoirs or particularly hot days or particularly cold nights? In the past BC Hydro had access to the 900 MW Burrard Generating Station (BGS) which could ramp up quickly to meet demand spikes. It has performed that job admirably since its construction between 1962 and 1975. In July, 2009 the BC Utilities Commission (BCUC) issued a report stating that “the Commission Panel declines to endorse BC Hydro’s proposal to reduce its reliance on Burrard for planning purposes” (page 115). In other words the BCUC found it to be in the public interest to continue to operate BGS during demand peaks as required (typically less than 10% of capacity on an annual basis). On October 28, 2009 the BC Government issued a press release over-ruling the BCUC decision and has subsequently not allowed BC Hydro to include BGS for planning purposes. This administrative decision effectively removed 900 MW of firm capacity from BC Hydro’s generation fleet and provided some justification for the acquisition of new generation from IPPs (as stated explicitly in the press release). Another side effect of this decision was the rejection of any upgrades to BGS that could have substantially reduced the Greenhouse Gas emissions of the facility while show-casing relatively environmentally friendly CCGT technology – technology that is being aggressively deployed in many other jurisdictions. Even without considering BGS there is considerable debate about whether or not BC is actually “self-sufficient” with regards to electricity generation. The situation is made more complicated by the Columbia River Treaty between the U.S. and Canada. This treaty, ratified in 1964, allocates up to 1.2 GW of generation capacity in Washington State to Canadian “ownership” in return for Canadian dams constructed on the Columbia River in aid of flood control in the U.S. As a matter of practice BC Hydro has not taken this electricity in kind but has instead received the proceeds from the sale of this electricity to U.S. customers. There are also two industrial concerns (Rio Tinto Alcan and Fortis BC) which own and/or operate hydro-electric facilities with approximately 1.3 GW of generating capacity. Both of these organizations have the ability to enter into electricity sales agreements that are not controlled by BC Hydro, including export sales. More detailed analyses of the “self-sufficiency” conundrum can be found in studies by Sopinka and Kooten (2010), Hoberg and Sopinka (2011) and Sopinka and Pitt (2013). 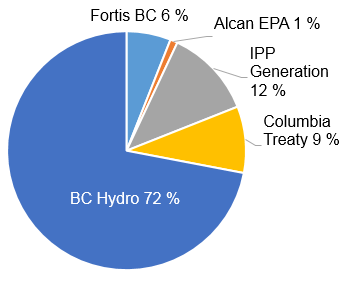 A chart indicating the various sources of generation in BC as of 2011 is shown below. The bottom line is that it would be very difficult to conclusively state that BC has insufficient electricity generation assets to meet domestic needs in the foreseeable future. 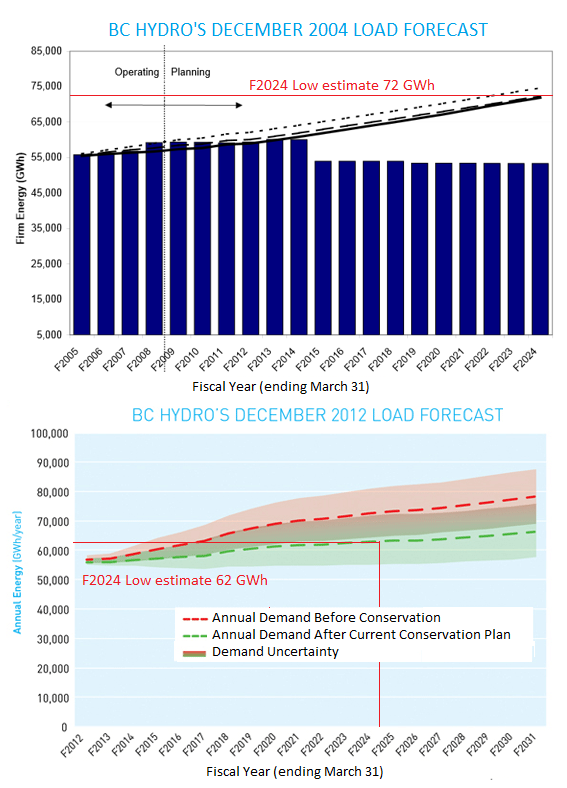 The second issue driving the need for additional IPP generation in BC is the forecast for future electricity demand. This too, is a contentious issue. In 2004 BC Hydro forecast that annual electricity demand would be 72-76 GWh in 2024 as shown in the chart below. Without additional generation additions and with the loss of Burrard Generating Station a growing deficit in generation capacity was forecast. Eight years later the 2024 Forecast should have been much better defined. In fact, the revised forecast is for between 62 and 72 GWh. Not only has the total amount moved down but the uncertainty has increased significantly. Even this downward revision of demand seems to be too high. Although the figures displayed in various BC Hydro publications are not totally consistent the “domestic” demand listed in the 2012 Annual report (page 91) was 52.197 GWh. This is considerably less than the 57 GWh forecast in 2004. All things considered it is very difficult to feel comfortable that BC Hydro projections are solid enough to warrant entering into long-term contracts for additional IPP generated electricity – electricity that is very significantly more expensive than that produced by existing legacy hydro facilities. The impending development of some LNG facilities in Northern BC may lead to an increase in demand. However, it is quite likely that these plants will generate their own power using natural gas. So what is the optimal path forward regarding electricity generation in BC? It seems to me that there is too much uncertainty around demand projections, the impact of conservation programs, LNG developments and most importantly Government policy regarding use of the Columbia Treaty allocation and other aspects of electricity “self-sufficiency” to be able to easily discern that path when considering BC in isolation. However, if we broaden our perspective to include a more regional view I think there are some hard facts that may point us in the right direction. The Alberta and Saskatchewan economies are growing relatively quickly and both provinces are heavily dependent upon coal-fired plants for electricity generation. Alberta has also made a significant commitment to developing its abundant wind resources and has more than 1 GW of capacity installed as of the end of 2012. More wind developments in both Alberta and Saskatchewan are planned but integrating this intermittent resource is proving to be a challenge. The Alberta Electricity System Operator (AESO) has undertaken a multi-year investigation into how this challenge can be overcome. Hydro facilities have the ability to follow rapid changes in the transmission system because output can be varied in less than a minute. As a result, using hydro to cushion output variability from wind farms is a very effective strategy. In Denmark and Germany this is accomplished using hydro resources from Sweden and Norway. So here is a proposal. The Site C dam proposed for development by BC Hydro is currently undergoing environmental review. It remains unclear if this additional electricity is actually needed in BC. However, this dam, located as it would be only about 100 km from the Alberta border, could act as backup to a much expanded development of wind resources in Alberta and potentially Saskatchewan as well. The current plan is to equip the dam with 1.1 GW of generation capacity. But what if that was increased to 1.7 GW? Production at that rate would deplete the reservoir and is therefore unsustainable over the long term. But production at that level would be possible for many hours, possibly a few days – enough time to cover calm periods in Alberta when there was very little wind resource. This over-capacity could work in conjunction with up to 2 GW of wind farm development in Alberta to reliably deliver emissions-free electricity to both provinces. The amount of “firm” and dispatchable electricity would be the average output of the wind farms plus the average output of Site C – roughly 600 MW of wind (at a capacity factor of 30%) and 1.1 GW from Site C for a total of 1.7 GW. In periods of high winds (> 600 MW) electricity would flow into BC and the Site C output would be cut back and the Site C reservoir would be refilled. When Alberta wind farm output was low the excess generating capacity at Site C would be used to make up the difference, drawing down the reservoir. Both Alberta and BC could be guaranteed a certain amount of electricity. 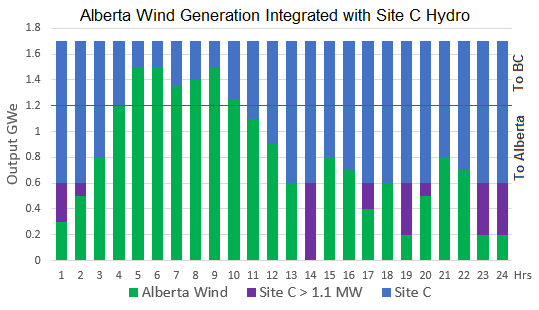 For example, if it turns out that BC does not really need all 1.1 GW from Site C then the output could be split with Alberta receiving 1.2 GW of the aggregate 1.7 GW and BC receiving 500 MW as shown in the chart below. In that situation Alberta would be agreeing to purchase an average of 600 MW of output from Site C.
If it turns out that BC needs more than 1.1 GW from Site C then the output could be split differently with Alberta receiving perhaps 400 MW and BC receiving 1.3 GW. In that situation BC would be agreeing to purchase an average of 200 MW of wind generated electricity from Alberta. The split could be renegotiated from time to time. This proposal would allow the two provinces to work co-operatively to develop emissions-free electricity generation to meet future requirements. By pooling demand and negotiating a split of output that worked well for both provinces the risks associated with developing Site C and greatly expanding wind generation in Alberta would be minimized. This approach could serve as a model for similar arrangements in different parts of North America. I recently joined a discussion about how gravity might be used to generate and store energy. 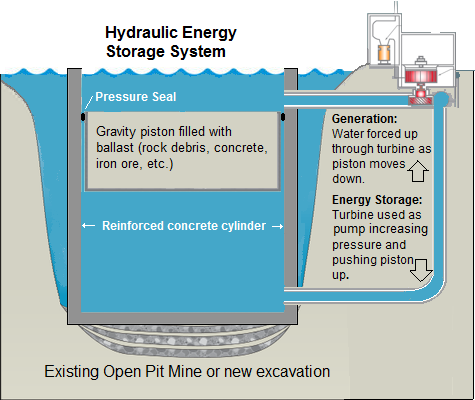 One of the comments provided a link to Gravity Power, a company that has proposed a modified take on “pumped storage” whereby a vertical water reservoir is used with a heavy piston. During the discussions a few variations on this technology were proposed. 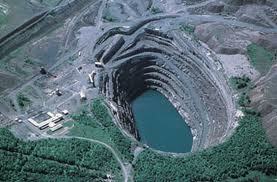 I suggested that abandoned open pit mines might represent a good starting point for very large facilities. As in my earlier posting on Funicular Power the principle behind Hydraulic Energy Storage is to use excess electricity generated mainly from wind farms when demand is low (for example at night) to raise the potential energy of a mass by moving it to a higher elevation. In this case the means to do that is a relatively standard hydro turbine in a very non-standard configuration. In energy storage mode a massive solid piston is raised by increasing the water pressure below it by running the turbine in reverse, acting as a pump to force water down the penstock. In generation mode the piston is allowed to sink forcing water back up the penstock and through the turbine. The piston would be a large concrete “cup” filled with as heavy a material as could be justified by the economics of the project. This could be rock debris, dense concrete, or even iron ore. The denser the material the better. The containing cylinder would also have to be reinforced concrete. Between the cylinder and the piston there would have to be a pressure seal. This could be a large rubber or plastic tube such as that used to contain oil spills. The concrete pour required to line the hole and create the cylindrical “cup” is not overly large compared to a major hydro dam. A solid concrete piston would be rather expensive – on the order of $150 million in this example. It would be much cheaper to fill the “cup” with rock debris although this would be less dense. Increasing density by adding iron filings or using “dense” concrete would be useful but expensive. Based upon other large engineering projects and mining operations this facility could probably be constructed for less than $1 billion – possibly less than $500 million. While that is a large amount of money it would provide 86 times the energy storage capacity compared to the largest battery complex in North America for less than 20 times the price. The Notrees facility completed in December, 2012 by Duke Energy cost $44 million to construct and the battery performance will degrade over time. Hydraulic Energy Storage, which uses exactly the same components as a hydro dam, would have a useful life of as much as 100 years. Rather than trying to use an abandoned open pit mine which might be a long distance from transmission facilities Hydraulic Energy Storage could also be located close to a wind farm although that would involve additional costs associated with excavating a new hole. When it comes to long-term, dependable and reliable energy storage there are not a lot of options available. Creative use of existing technologies (see unpumped storage) or investigation of untested concepts such as Funicular Power and Hydraulic Energy Storage have to be on the agenda if we are serious about transitioning to a sustainable energy environment.